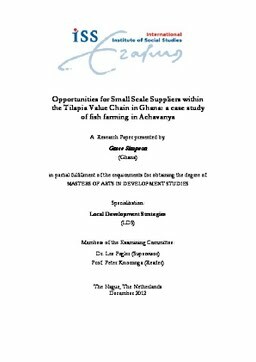 This research investigate the constraints within the tilapia value chain in Achavanya in the Dangme West District of Ghana It highlights the chain actors and the production processes within the chain and what the mode of chain organization means to the actors and the local people. The study found that poor management of the fish stock, lack of trust among the farmers, influential behaviour of the buyers as some of the major constraints in the tilapia value chain. The study also revealed six main chain actors and the production processes is labour intensive.